The breeding habits of members of the Picidae family include monogamy, cooperative breeding and occasionally, polygamy. The West Indian Woodpecker engages in polyandry (the female raises two broods with two different males). Their breeding season is from March through May, and during this time the birds excavate the holes in trees that will serve them for the entire year. Sometimes they use existing, abandoned cavities, but more often they prefer to excavate the cavity themselves since they will use it for both roosting and breeding. Woodpeckers, just as any living thing, require water and shelter. They will visit fountains, ponds, birdbaths and pet water dishes to find their water sources, and they will search for shelter and nesting opportunities in any number of places. These include an opening in a roof or attic, a hole they have excavated in the sideof a tree trunk, in a branch, even in a cactus, for those living in desert areas. Courtship consists of head-swinging, bill-touching, slow, exaggerated flights, intermittent copulations and vocal exchanges consisting of low tones. These are performed at the nest site. Both males and females attach to their sites by carrying out a slow, rhythmic form of drumming. 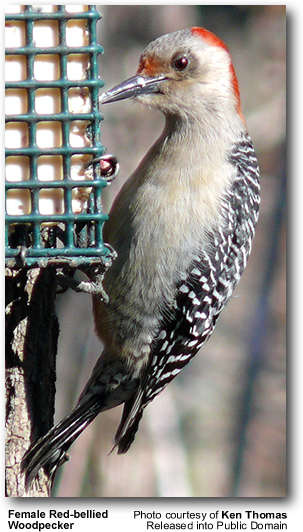 Some pairs, such as the Red-bellied Woodpeckers, drum simultaneously. The Red-bellied and Red-headed Woodpeckers engage in reverse mounting during which the female mounts the male before he mounts her. All members of the Picidae family nest in cavities, and almost all favor tree cavities. Those dwelling in deserts, however, nest inside holes in cactus, and a few species nest in holes dug into the earth. They are quite particular when choosing a nest site. They will find or hollow out a cavity that is just a slight bit larger than their own width. These holes can be round, rectangular, or gourd-shaped, and the Woodpecker explores dead trees that have a durable outer shell and a soft, pliable inner cavity. To the dismay of homeowners, occasionally the soft cedar siding of their houses meets these requirements perfectly! It is fascinating to watch the Woodpecker as he hollows out his nesting cavity. He is quite energetic as he drills his opening, forcefully flinging wood chips left and right. He will only use wood chips to line his nest. Many species excavate one hole per breeding season; sometimes they will create several holes before finding one to their satisfaction. 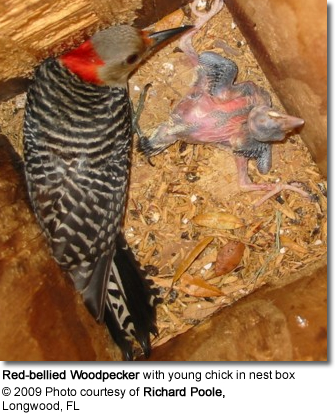 Woodpeckers will spend as long as a month creating their nesting and roosting site. Other birds and animals will use their abandoned hollows; these animals are considered “secondary cavity nesters.” There is great competition for the excavated nesting holes; other cavity nesters will attempt to take over the nest almost as soon as it is built. These competitors may be other species of Woodpecker, swallows, starlings, or mammals. To counter these assaults into their nest sites, Woodpeckers use a variety of strategies to defend their nesting sites—including aggression. One strategy, performed by the Red-crowned, is to dig the nest on the underside of small branch rather than in a tree trunk. This discourages larger animals and birds from usurping and enlarging it. The male is much more helpful to the female than most other species of birds. His efforts include helping to excavate a 1-2 foot nest, construct the nest, incubate the eggs, and raise the young. He does the majority of the cavity excavation, then he incubates the eggs at night so the female can rest. The female usually lays 2-5 round, white eggs. Due to the cavity nest’s location within the tree trunk, the nest does not require camouflage, and the white color of the eggs allows the parents to find them in the darkness. The pair will incubate the eggs for about 11–14 days before the altricial chicks hatch. In another 18–30 days the nestlings are ready to leave the nest.